Imagine... a Royal Wedding at the Palace! You are the Princess Bride, and your Groom is the handsome Prince. Your families and friends have all gathered in the Chapel, and there is an air of hushed anticipation as the Court Organist plays the concluding strains of his Prelude. A flourish of trumpets signals your Princes entrance at the altar. Then, a stately march accompanies your Bridesmaids down the aisle. Following them, the flower girl spreads rose petals from her basket to adorn the aisle for your big walk. Your Court Trumpeters raise their heralds once more, and the fanfare you chose for yourself rings forth, brilliant and clear! Your guests rise, your Procession begins, and you take your first steps into a fantasy-come-true: Your Royal Wedding! Soon, you and your Prince are heralded back up the aisle to the triumphant sounds of trumpets and organ, and the big celebration begins. Your Court Trumpeters will provide the proper atmosphere with music of nobility: Handel, Telemann, Mouret, Purcell and a medley from Camelot set the tone for your Royal Reception. Later, each couple in the wedding party is announced with their own Fanfare as they walk to the head table. And the final, most brilliant fanfare is sounded for the Prince and Princess themselves! Let the Wedding Feast begin! Your wedding doesnt have to be at Buckingham Palace for you to enjoy the special majesty created by Gabriels Trumpets. In any setting, large or small, indoors or out, this heavenly Trio provides the atmosphere of a Royal Wedding for you and your guests. Gabriels Trio got its start playing flourishes and carols at the Old English Christmas Feasts at the Hotel Mark Hopkins. Their well-timed flourishes heralded the Lord Mayor's announcement of the dinner seating and each course of the Feast. Gabriels Trumpets have performed for the San Francisco Symphony, Opera and Ballet, City Hall, the San Francisco International Film Festival, Gumps, Ghirardelli Square and The Tech Museum of San Jose, just to name a few. 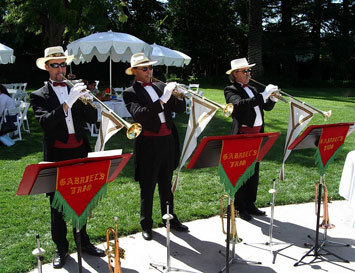 Our trumpeters sound great outdoors, as well as in a church, cathedral, ballroom, convention or concert hall setting. We can perform our music either a capella or in combination with organ, piano, harp, guitar, violin, woodwinds or string groups. We present the softer side of Gabriel's Trio by switching from Herald Trumpets to Flugelhorns. This is especially apropos for quiet Prelude, Interlude and Background Music. During the Cocktail Hour, let Gabriel's Flugelhorns massage your soul with the mellow tones of smooth jazz, ballads and love songs. We are versatile enough to match your vision - and your budget - by engaging as few as one (Gabriel's Trumpet) or two (Gabriel's Duo), to as many as six or eight Herald Trumpets. We have a selection of colorful Trumpet Banners to choose from, or you may commission us to create custom banners for your event. Let Gabriel's Trumpets be your very own "Court Trumpeters." Book us now for your event!